A member of my homebrew club brought a ton of hops to our Christmas party in January to give out and I went home with three good sized bags of hops. Two of which were Chinook, which I really dislike when used for bittering. I mentioned on twitter that I wasn’t sure what to do with all of these chinook hops, and another member of the club, Tyler, tweeted back that he was in the same boat. 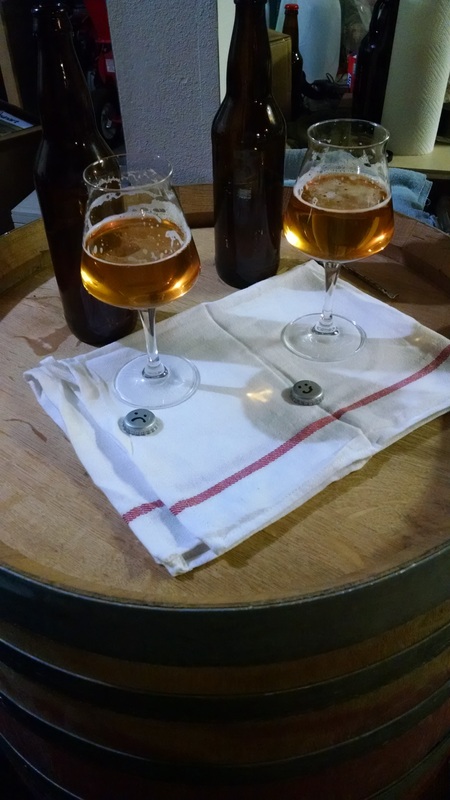 An interesting idea that’s been floating around in the craft brewing and homebrewing arenas recently is getting yourself some generic american light lagers, opening the bottles and dry hopping them with a few pellets of hops. You use a variety of hops (though only one variety per bottle) let them steep at room temp for a few days, then chill, decant and taste. It’s a way to give yourself an idea of how that hop variety would taste when used as a dry hop without much in the background beer to muddy the waters (so to speak). I believe this idea originated with Anchor Brewing. This idea resonated with tyler, and he suggested we do so with a large variety of hops and bring the resulting beers to the next club meeting since the theme was hoppy beers. He got some additional hop varieties donated from our LHBS, I had some additional pellets in bulk in my fridge, in all we ended up with 11 different hop varieties dry hopped in Coors Light since we couldn’t bring ourselves to buy Bud (lesser evil I guess? we were gonna get Miller Lite but couldn’t find it in bottles). I was surprised at the lemonyness of the Hallertauer Hersbrucker. That wasn’t something I would expect from a noble hop. I didn’t hate EKG or Chinook as dry hops. I generally dislike both of these hops when used in the boil. I’m actually looking forward to using the Chinook as a dry hop in some saison down the line. I thought Mosaic was disgusting, it was super cat pee. I’ve gotten this before from beers featuring Mosaic, but generally not as a dry hop. I used to think it was a 30 minute addition that brought out the cat pee for Mosaic, but now I’m wondering if there’s something else at work here (harvest time, hop yard, vintage?). The Willamette were cheesy, I guess they hadn’t been stored well, but it’s still not a loss, I’m going to put them into a paper bag and let them sit out and fully oxidize, the cheesiness well go away and they’ll eventually be good hops for use in sour beers. 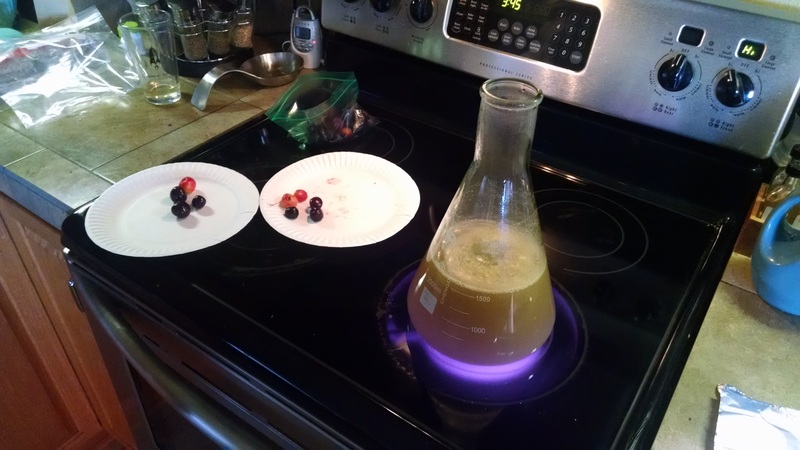 All in all it was a cool experiment and an easy one to do to try out a whole bunch of hop varieties. Just don’t be too upset about drinking some hop particles as they don’t always like to stay at the bottom of the bottles. Appearance: Fairly clear light straw color with minimal head that dissipates quickly into a thin surface lacing. Vastly different from the other raw beers. Aroma: Slightly hoppy with a rustic barnyard note: earthy, herbal. Taste: Grainy, herbal, a touch of citrus/lemon, funk throughout. I love it. The taste is everything I want out of a farmhouse ale. Mouthfeel: Fairly thin but not watery; hard to explain. Overall impression: This is a great beer; like I said above, it’s everything I want a farmhouse ale to be. I’m really pleased with this, especially since I was initially considering dumping it. This was the other half of the batch with the cypress/lemon balm wort, fermented with a wild sacc/brett mix for four months. It had this sort of unpleasant dirt flavor going on that I really disliked, I think from the lemon balm? 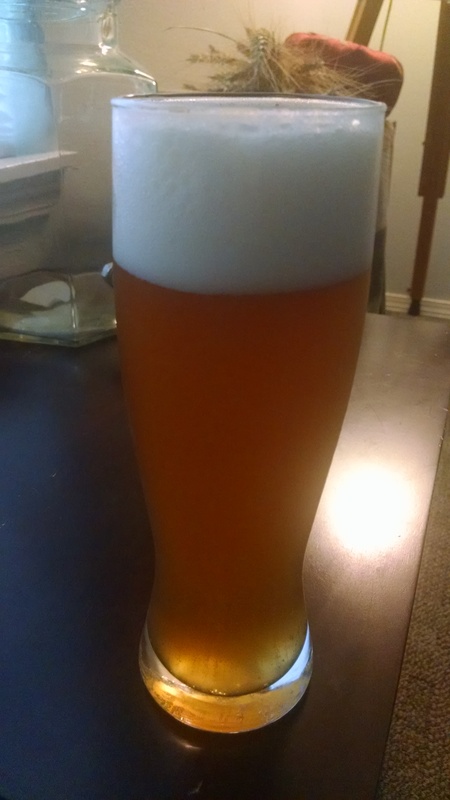 I figured I should try dry hopping it so I filled a bottle from the fermenter, dropped a couple of horizon pellets in and a carb tab, after a week it was pretty good. 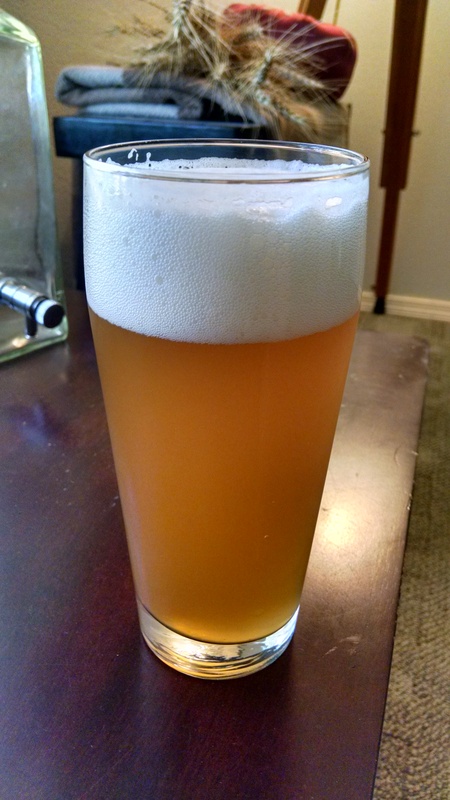 I tried it again with some glacier pellets and it was also good so I kegged it with both and I was blown away! The dirt flavor is gone and replaced by this pleasant citrus note. Additionally the hops just seem to accentuate the funk from the brett. I need to dry hop with these hops more, they really are my favorite varietals. Another thing rather striking is the clarity of the beer. Considering the other raw ales were quite hazy this one is downright transparent. I don’t know if that’s from the time or the brett or both. Appearance: The beer is a pale amberish to slightly red in color, with a respectable amount of head upon pouring that condenses into a mat of foam capping the beverage. Aroma: A hint of roast (I assume from the victory malt) and subtle esters. Taste: Malt and mild roast with maybe a bit of hoppy astringency. I think I don’t like the Sonnet Hops that I tried out for this beer. There are some subtle esters below the surface but nothing that really stands out. Mouthfeel: Thin with high carbonation on the tongue. I may have bottled this too early. Overall Impression: I don’t really like this beer all that much. Not that it isn’t a good beer, it is. There aren’t any off flavors that I can detect, I think it’s just the matter of I don’t like the Sonnet Hops. That said, I prefer the control I fermented with the same yeast (the one that came from my neighbor’s honey) that hadn’t been dried on a stick. The control seems to have more fruity esters and bubblegum flavor that I really like about this yeast. 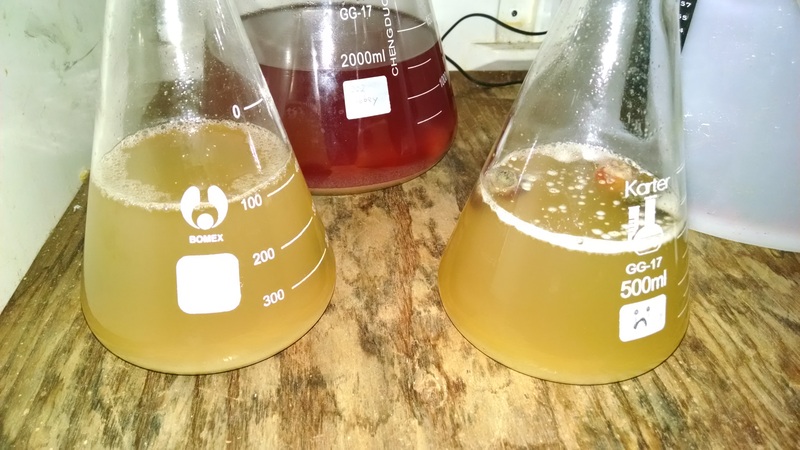 Now that I think about it, the kveikstokk yeast is a bit more similar to other wild yeasts I’ve captured from around the area here. 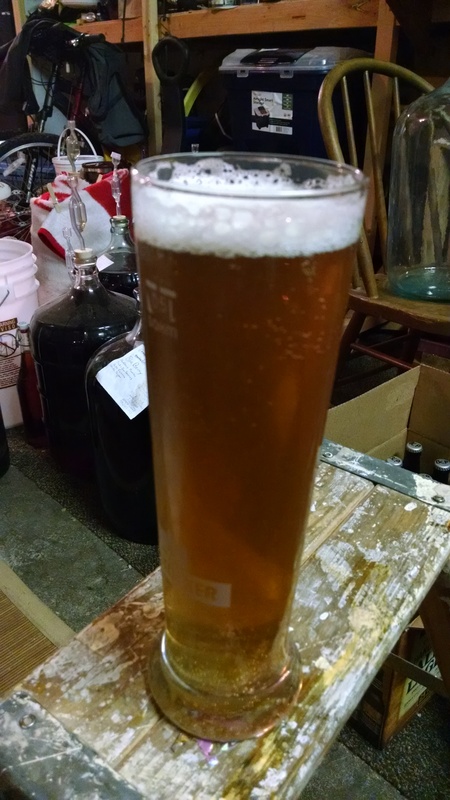 Appearance: The beer pours a hazy light amber with a ton of foamy white head. As the foam collapses it forms a dense foamy cap that does not dissipate, or at least it hung around until I finally drank it down with the final gulp. Lacing is abundant. Aroma: Wheaty with a slight maltiness, but the dominant aroma is of the spruce tips, a hint of pine but mostly a sort of cool fruity citrus? I know that doesn’t make any sense, deal with it. Taste: Spruce up front, not piney but more fruity with a hint of ascorbic acid that grudgingly gives way to malt/wheat on the finish with a very slight fusel alcohol burn probably from the hot ferment. Mouthfeel: Very full bodied despite the FG of 1.003, probably due to the extra protein. Overall impression: This is a good beer, but not great. I’m not sure if that’s particularly due to the fact that it is raw, I think it’s more due to fermenting it too hot than anything else. I also think it could use a little more hop presence which can probably be achieved with additional mash hops and/or some hops in the first wort/whirlpool. I’ve read that raw ales do not last more than four to six weeks (though I’m not sure when you should start counting). It’s been nearly a month since brewing this beer and it’s only improved thus far. I’ll be sure to update this post if it declines (or if it doesn’t).